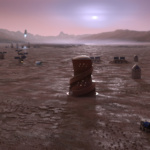 After four years, three stages, and countless submissions, NASA’s 3D-Printed Habitat Challenge is winding to a close. 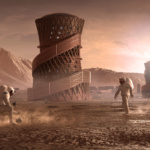 The space agency’s competition to design a habitat that could be built on the Moon, Mars, or other planets made of local materials is reaching the final stage, and NASA has awarded $100,000 to be split among the three winners of the complete virtual construction stage. Eleven teams submitted proposals for the complete virtual construction stage, and on March 27, New York’s SEarch+ and Apis Cor took first place and received $33,954.11; the Rogers, Arkansas–based Team Zopherus took second and received $33,422.01; and New Haven, Connecticut’s Mars Incubator placed third and received $32,623.88. 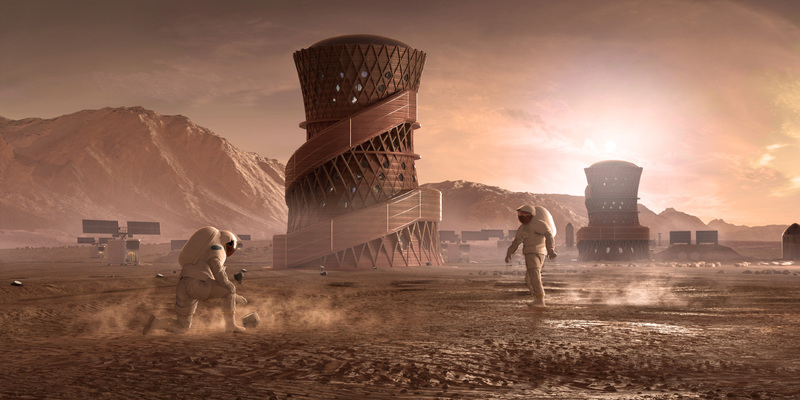 The complete virtual construction challenge asked teams to digitally realize their designs in the Martian environment using BIM, building off of an earlier stage in the competition that involved renderings. This time, competitors were judged on the habitat’s layout, programming, scalability, spatial efficiency, and constructability. 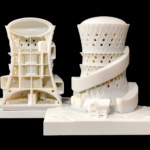 Smaller 3D-printed models and videos were also produced. 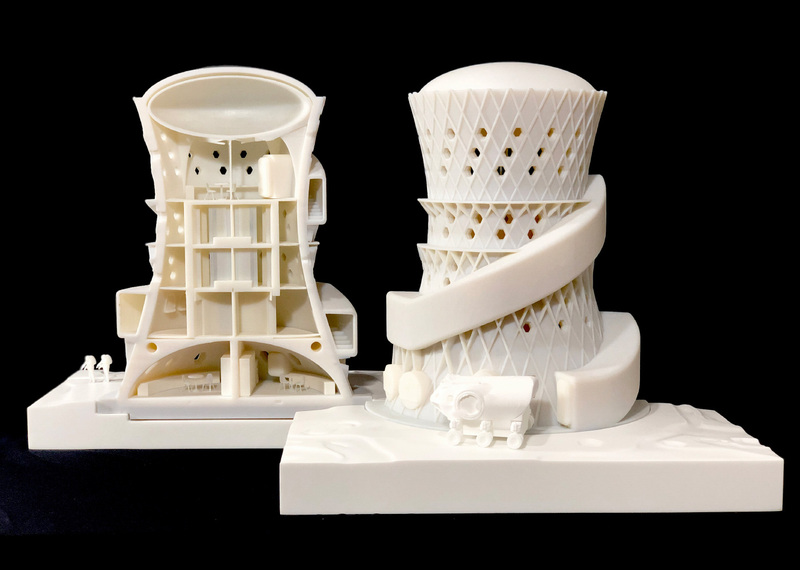 SEarch+ and Apis Cor proposed a series of tiered, rook-like towers printed from Martian regolith. The habitat’s hyperboloid shape, resembling a squeezed cylinder, arose naturally from the need to contain the building’s inward pressure; in a low-pressure environment, the greatest force exerted on a pressurized structure is a gas pushing outward (think of inflating a balloon). The habitat’s living areas and laboratories are connected but compartmentalized in case of an emergency thanks to a central service core. Each hexagonal window assembly was designed to be easily assembled in-situ and would contain redundant seals and pressure panes. 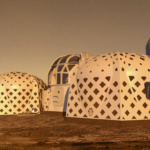 Zopherus’s concept was simpler and lower to the ground, consisting of a series of latticed domes. 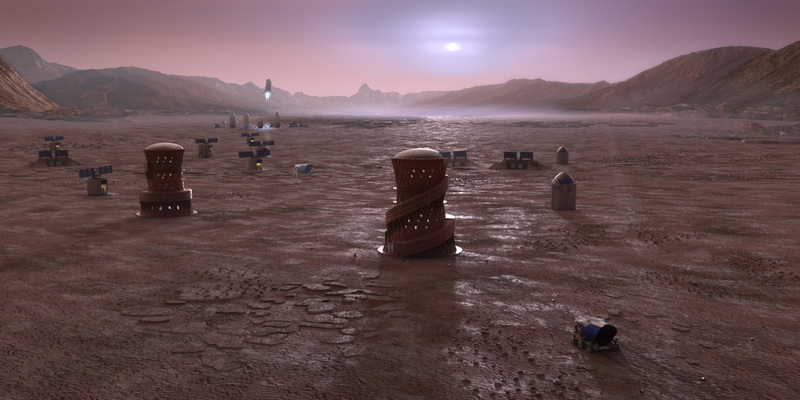 The habitat(s) would be assembled by a lander, which would launch a series of autonomous robots to collect the raw materials. 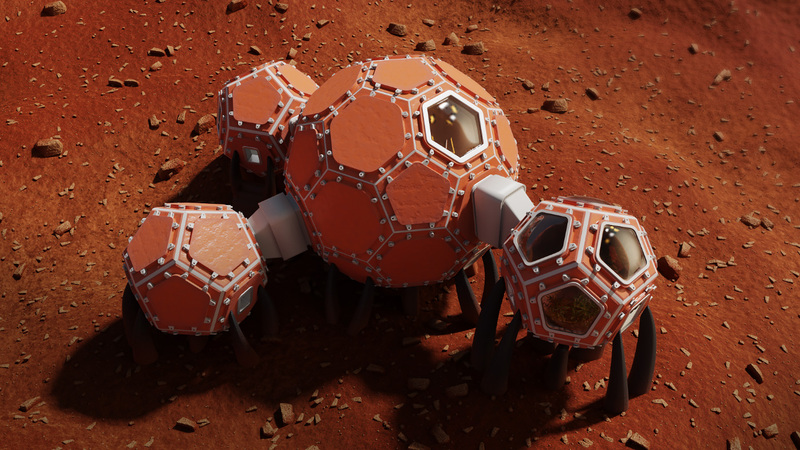 It would then mix the materials and print each hexagonal structure from the ground up, making “concrete” from Martian dirt, ice, and calcium oxide. 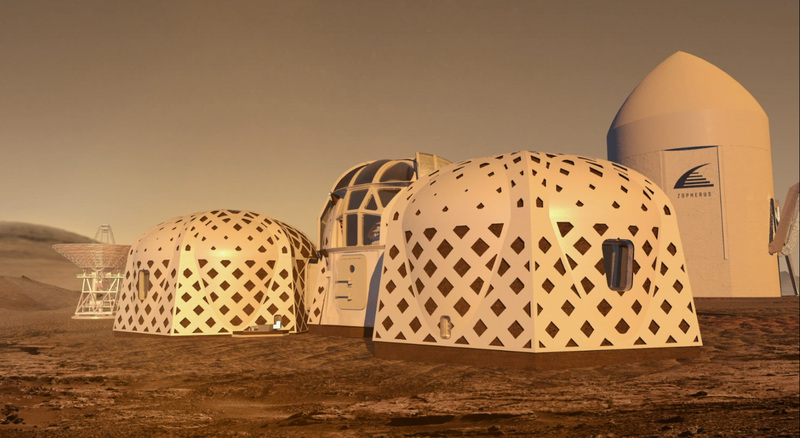 The habitat and adjoining modules would be optimized to capture as much sunlight as possible, but would also include sliding panels to shield the windows for when the solar rays would be too intense. Mars Incubator chose to use a modular panel system for their proposal, utilizing regolith to create the panels’ plates. 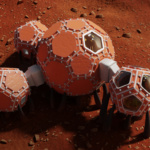 A central icosahedron would connect to several supplementary pods, and the entire structure would be elevated via a series of support struts, with the critical systems buried below. The primary living space would branch off and connect to a vestibule, multi-use space, and bio-generation pod where plants could be grown. 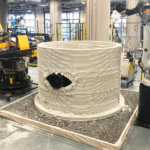 The 3D-Printed Habitat Challenge is part of NASA’s Centennial Challenges program and is managed in part with Bradley University. 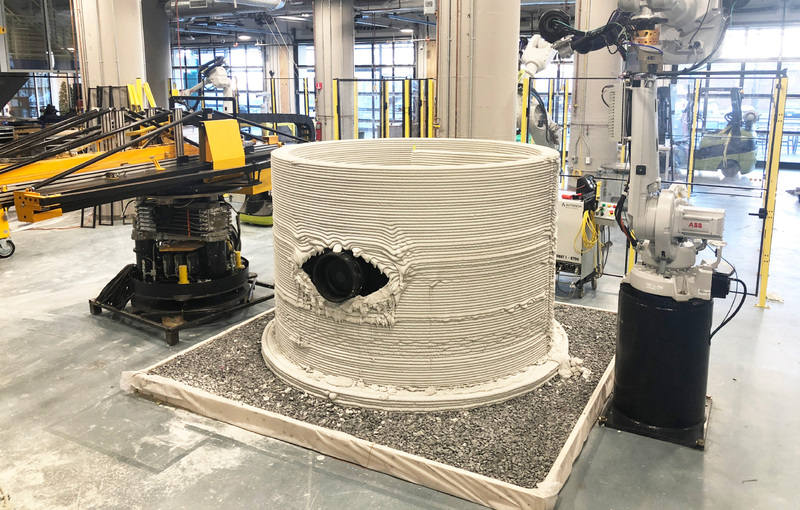 The complete virtual construction stage was the fourth of five stages in the third phase, and the last leg of the competition will be held from May 1 through 4 at Bradley University in Peoria, Illinois, where teams will 3D print one-third scale versions of their habitats. The winners will split an $800,000 pot.